The word "amateur" is often used as an insult, and we've forgotten its true meanings: devotee; admirer; one who engages in a pursuit, study, science or sport as a pastime rather than as a profession. I studied piano for a few years in my 20s, and ever since I have admired adults who make time in their lives to learn an instrument—not because they have to, but because they want to. 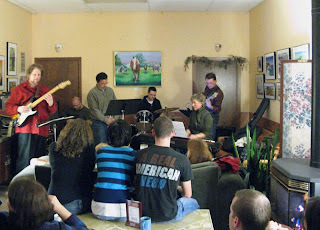 On Friday night, Betsy's Back Porch Coffee Shop in south Minneapolis, which opened its doors in January 2002 and nearly had to close them a few months back until neighbors held a fund raiser, hosted a group of grown-ups who not only study jazz but also perform it in public, an act of commitment and raw courage. When I was studying piano, I couldn't bring myself to play from sheet music in public, much less improvise. They began with a standard, "Night in Tunisia," but everything else was composed by Meyer and the trumpet/flugelhorn player, Todd (Tangey?). We heard Todd's laid-back "Get It Done" and mysteriously named "Dancing Cocktails," and Meyer's speedy, challenging "And Another Thing," along with her tune "Do Right" and lovely ballad "FAQ." The finale was Todd's uptempo "Rebound." Betsy's was SRO, with 30 or 40 people listening and applauding. I was glad to be there. It felt communal and hopeful; it was serious-minded and happy at the same time. And if this type of event is happening here, chances are it's happening in other towns and cities, too, in their coffee shops and churches, community centers and living rooms. Photo: The back room at Betsy's. Renz is on the left, and there's a fire in the wood-burning stove.